For the expression, see Jesus H. Christ. 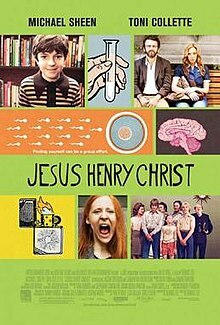 Jesus Henry Christ is a 2011 American comedy film based on Dennis Lee's student short film of the same name. It was released on April 20, 2012. The film was directed by Lee, who also penned the screenplay. The film was produced by Joseph Boccia, Sukee Chew, Lisa Roberts Gillan, Deepak Nayar, Julia Roberts, Philip Rose, and Katie Wells. The film stars Jason Spevack, Toni Collette, Michael Sheen, Samantha Weinstein, Frank Moore, Mark Caven, and Paul Braunstein. Henry (Jason Spevack) is a precocious 11-year old boy, conceived in a petri-dish and raised by his single mother, Patricia (Toni Collette), and is smarter than all of his peers. However, the one question he can't answer is, who is his father? Henry's attempts at locating his father lead him to Dr. Slavkin O'Hara (Michael Sheen), a university professor who has decided to raise his daughter, Audrey (Samantha Weinstein), as a psychology experiment in a world free of gender bias. Patricia starts fearing that she's losing her son, Audrey wishes she didn't have a father, Dr. O'Hara has no idea how to keep his daughter happy, and Henry may just have found the family he was looking for. The film had its world premiere in April 2011 at the Tribeca Film Festival before going on general release in the US on April 20, 2012. It grossed $20,183 at the box office. John Anderson of Variety magazine says the film is "Too deliberately eccentric" but that it "does feature some standout performances and a refreshingly unconventional approach to telling its slight story." ^ "School of the Arts Filmmakers in Tribeca Film Fest". Columbia University School of the Artsdead-url=yes. Archived from the original on January 9, 2015. Retrieved January 9, 2015. ^ "Jesus Henry Christ". Box Office Mojo. Retrieved January 7, 2015. ^ "Jesus Henry Christ". Rotten Tomatoes. Fandango media. Retrieved March 31, 2019. ^ "Jesus Henry Christ". Metacritic. CBS Interactive. Archived from the original on 2015-11-15. Retrieved March 31, 2019. ^ "34th Annual Young Artist Awards". YoungArtistAwards.org. Archived from the original on 2013-04-02. Retrieved 2013-03-31. This page was last edited on 31 March 2019, at 03:12 (UTC).